Jimmy, King of Clerkenwell. Photo & text John Londei. Photo © John Londei 1983. 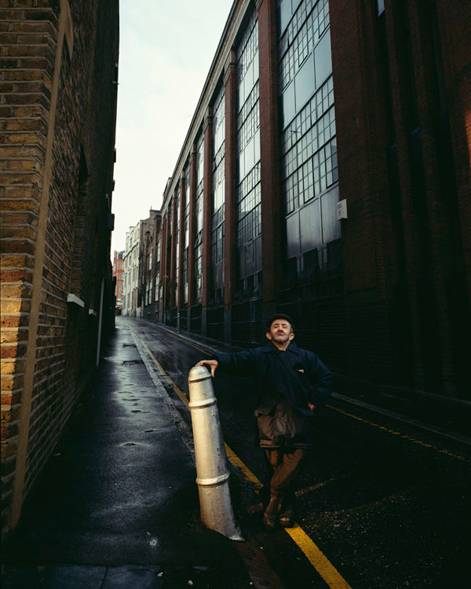 Some people might think little Jimmy Cleary eccentric, but to me he was a walking landmark: someone whose presence brings a touch of magic to an area. Whenever I saw Jimmy I knew I was in Clerkenwell. Jimmy’s speciality was annoying motorists. He would not tolerate errant parking; his life seemed devoted to chasing drivers on from yellow lines. And woe betide anymore who ignored his orders! Bringing out a tattered notebook he took their number, and created such a commotion that the poor motorist found himself the centre of attention. I’d always wanted to photograph Jimmy. He’s an elusive person and I knew it would be difficult to persuade him. I couldn’t believe my luck when he said yes. On shoot day we picked Jimmy up in a van – he enjoyed being in a vehicle – and took him to the location I’d chosen. I was ready to take the shot, then a car decided to go up the road where Jimmy stood, only to meet by a car coming the other way. Each refused to move, it became a stand off and Jimmy was mesmerised watching the ensuing argument. The standoff went on for twenty minutes, the weather deteriorated and the shoot was under threat. When they’d finally settled their argument I was at last able to take Jimmy’s picture. It’s strange how serendipity can contribute to a shot Were it not for the delay I’d have missed that moment when, fleetingly, the sun broke through a cloud, hit a bronze tinted office window across the street, and bathed Jimmy in a pool of golden light.